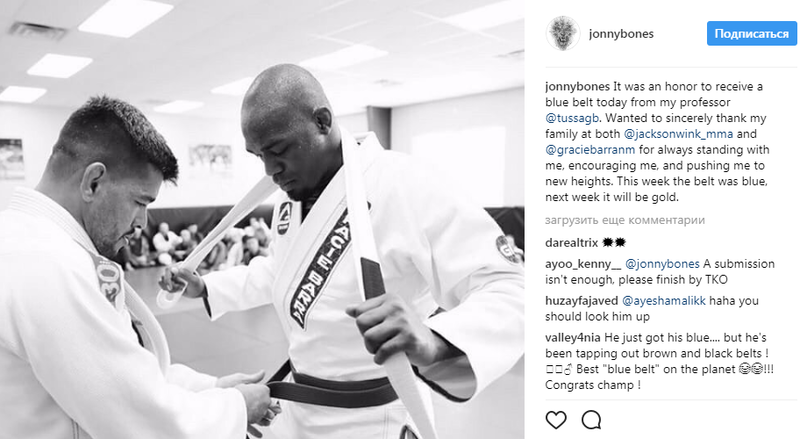 Jon Jones has been promoted to blue belt in spite of an impressive MMA career. 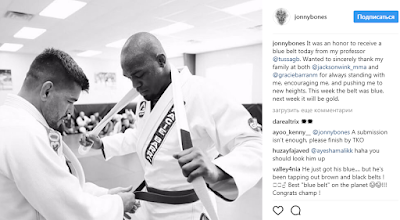 The former UFC Light Heavyweight Champion and man who were widely considered one of — if not the — best mixed martial artists in the world received his belt from four-time No-Gi World Heavyweight Champion Roberto Alencar from Gracie Barra New Mexico. That’s not to say that Jon “Bones” Jones is “just a blue belt” though. He manhandled high-ranking jiu-jitsu practitioners and he tapped BJJ black belt Vitor Belfort via an Americana. Next week, Jon Jones will have a chance to get another belt wrapped around his waist — this one, black and gold — when he takes on reigning UFC Light Heavyweight Champion and heated rival, Daniel Cormier. Until then, Jones can enjoy his new blue belt.